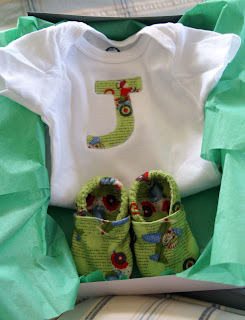 Here are some baby shower presents for a little boy who will be born soon! 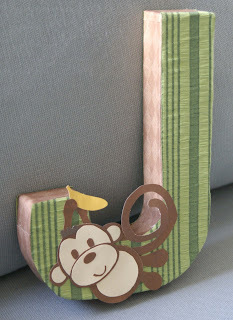 And for his room - a paper mache moneky J! Mama called the doctor and the doctor said, "NO MORE MONKEYS JUMPING ON THE BED!" Absolutely adorable! :-) I love the onesie with the little matching shoes! Gorgeous - what a Lucky little man!